When Casino Heroes was launched back in 2014; there was a whole new world to explore, namely “Treasure Island”. With over 40 regions and just as many bosses, to say that you “explored” the fantasy world was a bit of an exaggeration when it really was about a meter that took you from one boss to another. The potential was by all means there; and as a reward system; the bosses and regions worked well – but the game was very linear; and you did not really get immersed into the world. In 2015-2016 another world was added. The boss-fights became more fun, and the graphics improved slightly, but mostly the update (Casino Heroes 2.0), touched on mobile customization and “Rubies” and a free spins bunus was introduced. The biggest change of Casino Heroes with the third major update; will not mean the end of the progress gauge showing how far from the next boss you are at the moment; but it will finally be visualized. 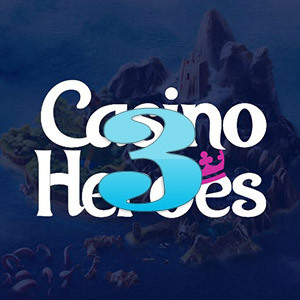 By playing your favorite castles at Casino Heroes 3, you will see your hero on a 3-dimensional map; and there will also be treasures to find along the way. It feels like this was what the Heroes online casino was supposed to be from the start; but for technical reasons, never really worked – until now. Better mobiles and faster internet connections dares you to bet without risking to shut out players without the right hardware. The new update also opens up the world, which will give you a third island with 10 new bosses. In the past we could only go on a adventure in one way. You played through a region and then proceed to the next. When you defeated all the bosses, you could move on to the next island. With the new update, we can jump freely between the three islands and their respective regions. The hero’s new casino becomes much more flexible and guaranteed a lot more fun. We can barely wait, because it was a long time since we defeated the final boss Betser for the first time. Now it is very important to play through the adventure again, especially considering all new taxes, but also for the pure visual experience.